We’re so used to buying spirits in fancy bottles that we sometimes forget that until the 1890s, gin was sold in barrels to the retailers who would bottle it themselves for customers to take home. In fact Tanqueray was even then distinctively different in that it didn’t use barrels but rather stylish large stone crocks. As more gin was sold in the off trade, distillers began to sell gin in bottles in response to the more sophisticated aspirations of a new more middle class audience. 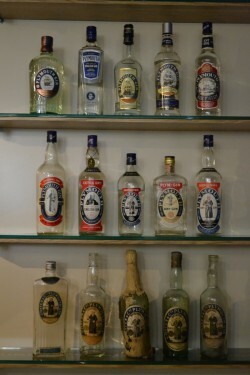 Looking at this picture of Plymouth Gin bottles down the ages it’s fascinating to see just how much bottle design has evolved. The Blackfriars monk is ever present apart from the sleek vodka type redesign that took place during the reign of Vin & Spirit, a new look that was generally agreed to have been a bit of disaster. Thankfully both he and the iconic Mayflower image (to mark the fact that the Pilgrim Fathers set sail for America from Plymouth) are now right back where they belong.